Small - €85.99 Medium - €85.99 Large - €85.99 Only 6 left! X-Large - €85.99 Only 9 left! You’ve got a little angel / devil scenario playing out on your shoulder, don’t you? On one side, you want to be the do-gooder and let your buddy shine tonight at his bachelor party. On the other...you quite like shining yourself, thank you very much! You don’t have to pretend to be noble for us! We love that you are not the type of guy who feels safer blending in among all the other black suits and we applaud you as a proud male trendsetter. We need more daring men out there who want to be noticed for their impeccable fashion sense. 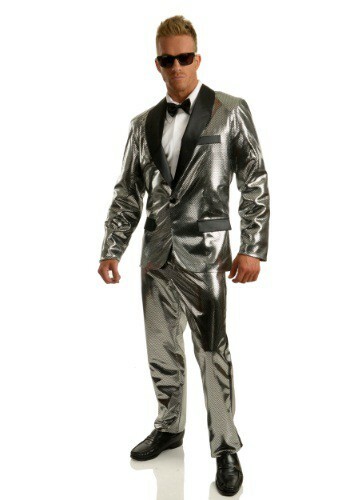 So go ahead, give in to that tiny little red guy whispering in your ear “buy this Men’s Silver Disco Ball Tuxedo Costume and you never have to settle for mediocrity again!” After all, you’d always prefer to be the center of attention, and what’s more central and attention grabbing the disco ball's dazzling sparkle?